The 120 cigar count Dakkota humidor is one of the most unique appearances you will find in a humidor available on the market today. 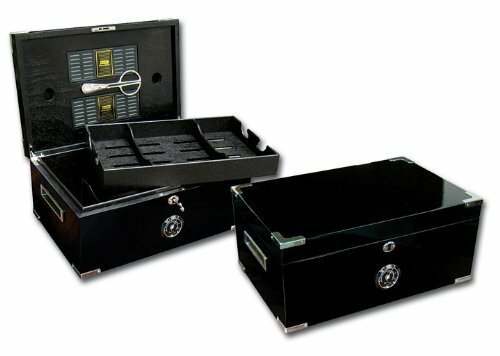 This rich jet black lacquer humidor features high polished stainless steel accents on all 4 corners (top and bottom) and a matching lock and key set. The Dakkota is then finished off with a silver frame black face hygrometer and recessed silver side handles to tie everything together in perfect balance. Opening the Dakkota is when things get even more interesting. The interior is done in a full black kiln dried mahogany creating one of the most unusual & dazzling designs you will find in a humidor. The humidifiers are set within a solid wood magnetic panel for a flush mount look. The magnetic panel can be removed through "finger accessible holes" on the front face of the panel for easy access to the Dakkota's dual humidifiers. For added convenience, stainless steel cigar scissors lay across the humidifier panel and are secured magnetically. Just select your favorite cigar, cut and smoke! Includes a removable tray with 2 adjustable dividers and a lower section with an additional set of 2 dividers. The Dakkota's wonderfully rare design and exceptional quality will impress virtually any cigar connesuir and makes for a fantastic conversation piece. (50) Fifty Boxes of Premier Menthol - King Size Cigarette Tubes - FULL CASE!